The UK’s chancellor has rejected suggestions he has abandoned a target to eliminate the budget deficit by the middle of the next decade. Questions over Philip Hammond’s commitment to the target were raised after his Budget last week which promised a big increase in spending. But he told the Treasury Committee on Monday that the target, set in autumn 2016, “hasn’t been abandoned”. There would, though, be a “balanced approach” to cutting the deficit. That “balance” meant weighing up the need to get borrowing down alongside other priorities like cutting taxes and raising public spending. But Mr Hammond told the MPs that this trade-off was nothing new. “I have said since the autumn of 2016 that I would take a balanced approach,” he said. This involved “recognising the need to reduce and ultimately eliminate the deficit in order to get debt falling sustainably – something we have now achieved – but also the need to support our public services, keep taxes low and, crucially, to invest in infrastructure, skills, training, research and development and support the future productivity of our country”, he said. Mr Hammond’s Budget spending rise was seen by many commentators as marking “the end of austerity”. But it also sparked debate about whether the chancellor could now balance the nation’s books by the middle of next decade. 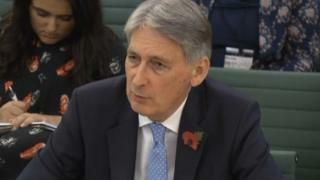 On Monday, Mr Hammond said he and Prime Minister Theresa May had made clear that ending austerity did not simply mean loosening the purse-strings in the public sector. “From our point of view, austerity is not only a measure of public sector spending, it also refers to broader issues,” he said. “As austerity comes to an end, I would want to see our public services being financed more generously than they were over the period of fiscal consolidation,” he told the committee.